“Go west, young man, go west” was the popularized clarion call in the mid to late 1800s as America continued her westward expansion in fulfilling her manifest destiny. In approximately 1980 B.C., the great patriarch Abraham (Abram) received a similar commission from God to leave his native home of Ur to go west to the land of Canaan. In Genesis 12:1, God told Abraham that he was to go to “a land that I will shew thee.” Have you ever wondered why God specifically chose Canaan over all other places in the world? We live in northwest Arkansas, and I think it’s a very nice and scenic place to live. God could have chosen Arkansas to send Abraham to, but he didn’t. As we shall discover, God did not haphazardly choose Canaan. He never does anything without purpose. He had a very definite reason for choosing this particular locale. I believe Canaan was God’s choice simply because it contained the real reason for His purpose, namely, Jerusalem. As we meander through the pages of scripture, we shall find that Jerusalem holds a special significance within the heart of God. When Moses was giving his farewell address to the Israelites right before they were to enter Canaan, he stated that they were to come before God “in the place which he (God) shall choose.” We know that three times a year the great feasts were to be held in Jerusalem. Even prior to that in Genesis 12: 5 and 11, that same phrase of “God shall choose” was cited as the place where they were to worship and offer sacrifices. This phrase was again referenced in Joshua 9:27 as the place where the “altar of the LORD” was to be. Genesis 22 gives us a historical account of God commanding Abraham to go to the “land of Moriah” for the purpose of offering up his only son Isaac as a burnt offering to the Lord. Obviously, God had no intention of Abraham making a human sacrifice, but only wanted to test Abraham’s faith. This test was not for the benefit of God, since he is omniscient and knew exactly what Abraham would do. It was, however, an object lesson for all the faithful for the centuries that followed. 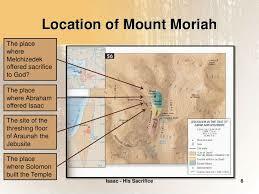 Interestingly, the “land of Moriah” refers to the geographical area of Jerusalem. Again, why did God specifically choose that very spot for Abraham to offer up a burnt offering? Almost a thousand years later, this particular small portion of land in Jerusalem would again enter history’s annals. In 1 Chronicles 21, we read that David had sinned against God by taking a census of the people. Instead of relying upon God, he was relying upon the strength of the people. After realizing his sin, he called upon God to forgive him. All sins require a blood atonement. Therefore, God instructed him to go and set up an altar in the “threshingfloor of Ornan the Jebusite.” Naturally, this was in Jerusalem. Amazingly, it was the exact location where Abraham offered up a ram as a burnt offering in the place of his only son Isaac. Was this just a coincidence? I think not. In 2 Chronicles 3: 1, the scriptures reveal that Solomon was to start a monumental building program. He was divinely commissioned to build the house of the LORD. It would later be known as Solomon’s Temple. Where should this magnificent and holy edifice be erected? The Bible clearly says: “in mount Moriah.” Why should this specific location repeatedly be the place where God chose and demanded that the atonement for sin be made? As we continue with the story of Jerusalem, we’ll step back in history to the time when Abraham initially entered Canaan. In Genesis 14, a most interesting and controversial personage is introduced within the biblical narrative, namely, Melchizedek. He was the king of Salem, which has traditionally been identified as Jerusalem. The Bible records him to be the “priest of the most high God.” Many expositors and Bible commentaries merely refer to him as an early Canaanite king. The writer of the book of Hebrews remarks, “now consider how great this man was.” His name literally means “king of righteousness.” Although many attribute him to be a theophany (physical manifestation of God) of the pre-incarnate Christ, I believe this conclusion fails on several points. When the three “men” appeared to Abraham when he was at his tent’s door before the destruction of Sodom and Gomorrah, the passage clearly indicates that Abraham recognized one of the three to be God incarnate. This is not the case here. However, Abraham does recognize him to having great spiritual character and position. Also, the passage presents him as a real historical person. Interestingly, Abraham seems to have knowledge about this person of renown. He should, since Abraham was of Shem’s direct lineage. In ancient times, ancestry and lineage were extremely important. I agree with the traditional Jewish interpretation of Melchizedek. They believed him to be none other than the patriarch Shem. After the flood, I believe Shem was directed by God to go to what was later to be called Jerusalem. He was to live some ten generations after the flood. Many believe that the term Melchizedek was a title and not a personal name. I agree with this premise. Again, we find Jerusalem in the center of God’s purpose and plan. As I continue with this saga, a somewhat obscure piece of the puzzle must be woven into the narrative. I am referring to the importance of compass directions. We are all familiar with the significance of the direction east. The Jews believed that the Messiah was to enter through the eastern gate of Jerusalem. In Malachi 4: 2, the Bible records that “the Sun of righteousness arise with healing in his wings.” This, of course, is a reference about Jesus. As the sun arises in the East to give light and life to the earth, so too, does Jesus as the Light of the World give life to mankind. In conjunction with this thought, we find in Numbers 2: 3 this statement: “And on the east side toward the rising of the sun shall they of the standard of the camp of Judah pitch…” I could cite more scriptures about the direction east, but that is not the compass direction that I want to emphasize. No, it is the north that takes preeminence in this story. Let’s begin with a familiar passage that references Lucifer’s fall as seen in Isaiah 14: 13. I will focus on just a portion of that verse: “I will sit also upon the mount of the congregation, in the sides of the north.” In doing any Bible study, it is always good to examine the original Hebrew or Greek meanings of the word being studied. In this context, the word “sit” means to dwell or inhabit. “Mount” is sometimes used figuratively in Scripture to mean promotion or an elevated place of honor. Of the three Hebrew words translated “congregation,” this one always refers to God’s earthly dwelling place…the tabernacle. Lastly, the word “north,” conveys the concept of judgment or to judge. Consider how it is thus used in Psalms 75: 2, 6, 7: “When I shall receive the congregation I will judge uprightly…For promotion cometh neither from the east, nor from the west, nor from the south…But God is the judge.” In his pride and arrogance, Lucifer wanted to dwell where only God can inhabit. He desired to have the authority to exercise judgment over all the angelic host. Evident in this passage in Psalms is the fact that the north was the place of judgment or promotion. In performing the patriarchal blessings to his sons, Jacob told Dan that he would “judge” his people. In their wanderings in the desert for forty years, it is no accident that the standard of the camp of Dan was to be placed on the “north” side. God even ordained that the North Star and the magnetic north would help man in their judgment of bearing. The plot now thickens. In Leviticus 1:11, 6:25 and 7:2, God instructs Moses that the killing of the animals for the burnt offering (to make atonement), the sin offering and the trespass offering were all to be offered in the same location…on the north side of the altar. Some two thousand years ago, the Son of God gave himself to be a sinless sacrifice for all of humanity. Through his death, he pronounced judgment on the sins of the world. This was done on Calvary’s hill on the north side of the walls of Jerusalem. In 1Kings 11 & 12, God said that he had chose Jerusalem “to put his name there.” The Old Testament name for Jesus was Joshua which literally means, “Yahweh is salvation or Jehovah saves.” Yes, his name was there to accomplish salvation for us, just to the north side of Jerusalem. In the Hebrew, the name Jerusalem means foundation of peace. The word “shalom”, which is translated as meaning peace, may denote completeness or wholeness. In the photo below, C. J. Lovik illustrates the amazing detail of the Hebrew language. The Hebrew letters may represent numbers or, as found in the ancient Hebrew pictographs, each letter tells a story. This is similar to other ancient languages, such as Egyptian hieroglyphics or Sumerian cuneiform. The translation found on the right side of the photo gives an accurate description of the redemption prophecy as found in Genesis 3:15. Again, it is Jerusalem where God first provided a temporary “wholeness” such as an animal skin to cover the sin/shame of mankind. In the verse just mentioned, God promised a permanent remedy for sin. This redeemer would once again bring “peace” back between God and man. I can’t help but think about the Garden of Eden. There was a time when God came down and fellowshipped with man, walking in the cool of the day in the Garden. It was a time of perfect harmony and peace. This indeed was the foundation or beginning of God’s relationship with mankind. I believe God enjoyed those quiet moments that he shared with his most prized creation, man. But, alas, tragedy struck! Man had sinned. He shattered that trust and communion that he had once shared with his loving and compassionate Creator. Being holy and righteous, God could not continue with that same loving relationship, since he abhors sin and unrighteousness. It wounded the heart of God. However, being a kind and longsuffering Savior, he was forced to step just outside (north) from that Garden of Paradise in order to find and an innocent animal. Blood had to be shed so that man’s nakedness and shame could be covered. Those animal skins provided just such a covering. Surely, one of the most historic events (and location) in man’s history should be remembered and commemorated. I believe that God is sentimental. The word sentimental means having or showing tender emotions and feelings. The scriptures say that God is “touched with the feeling of our infirmities.” Remember in the Old Testament, he commanded that the Israelites set up stones or boulders to commemorate a historic event (the crossing over the Jordan River). Is it not possible that God wanted to memorialize the location of the slaying of an innocent animal that was used to judge or atone for the sin of Adam and Eve? Is it not possible that Canaan could actually be the geographical location of Eden? Is it not possible that the Garden could have been situated where Jerusalem is now located? Is it not possible that the innocent animal God used to clothed man’s nakedness was actually killed just north of the Garden of Eden? Noah’s flood would undoubtedly have changed the topography of the entire world. However, God’s divine GPS system could pinpoint the exact location where Eden, the Garden and the slaying of the innocent animals were all located. Notice this passage in Jeremiah 2:7. “And I brought you into a plentiful country, to eat the fruit thereof and the goodness thereof; but when ye entered, ye defiled MY LAND, and made MINE HERITAGE and abomination.” There is something special about Jerusalem. That uniqueness began at the very beginning of the creation of mankind. The story of mankind begins with the Jerusalem story. If you consider all the evidence and clues that we find throughout the Bible, then the reason for God choosing Canaan and Jerusalem begins to take form. I say again, God does everything with purpose in mind. I believe this to be the real Jerusalem story.